Saturday, April 13 @ 9:00 a.m.
On April 13th, the Virginia Tech community reflects on the vibrant lives of the 32 students and faculty who were tragically taken from us on April 16, 2007. This community run/walk throughout the campus of VT strives to bring fellow Hokies together, to feel the support of the community, and to celebrate the lives of our friends and family members. Please note: you CANNOT go back and edit your registration. Please make sure you registration is correct (a confirmation box will pop to ensure your number of registrations and shirts). Please also be sure to complete your payment if you purchase shirts. You will need to check-in on Friday afternoon or Saturday morning to pick up your race bib and commemorative t-shirt if you ordered one. Please bring your confirmation email that includes your QR CODE (printed or electronically). If you registered multiple people under one email address, you will need to check-in all members of your group at the same time. Not all members need to be present, but the group will be checked-in as a whole. If you purchased multiple t-shirts within a registration, all t-shirts associated with the group will be distributed at this time. You may check in a friend or family member if you have their QR CODE. Please check-in on Friday to help with a smooth and prompt start on Saturday morning. The run is free of charge to all participants! There will be a $4 charge for the run t-shirt if participants want one. This charge is to cover the cost to make the shirt and will ensure that all participants who want to have a shirt will get one. Participants must register by Friday, April 5 to receive a shirt. The route includes Lane Stadium by entering through the TUNNEL that the football team enters through for every home game. Since this does get narrow and slower, feel free to use the ALTERNATE route and bypass the stadium if you prefer. 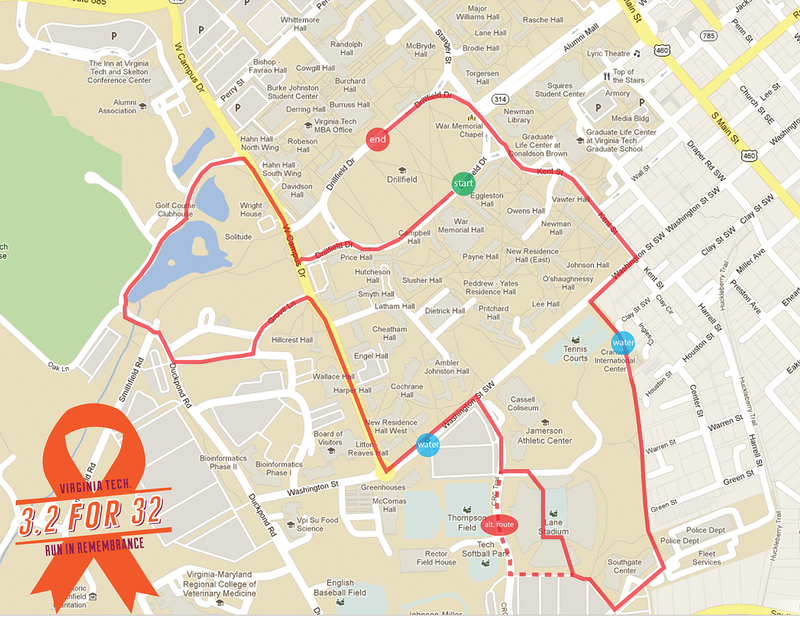 All runners and walkers will have to use the ALTERNATE ROUTE AFTER 10:30 am. As long as you pass the stadium by 10:30 am, you can still go through the tunnel. Please leave your pets at home. If you do bring a pet, you will need to take the alternate route instead of walking through the stadium. No Pets will be allowed inside the stadium! The event will take place rain or shine. In case of inclement weather, check www.vt.edu for announcements about all of the Day of Remembrance activities and updates.